An urgent action appeal for 27 April, International Day of Action to save the life of a woman migrant worker on death row. On Tuesday, April 28, Mary Jane Veloso will face the firing squad by the Indonesian government on a crime she did not commit. Mary Jane, single mother of two, is a victim of human trafficking and the Philippine government’s neglect. She is one among the many Filipino migrant workers abroad, who are forced to leave their families to look for jobs abroad and fell victim to syndicates who took advantage of her vulnerability. We hope to send a strong message to Indonesian President Joko Widodo that he will not solve the crime of drug trafficking by executing an innocent life. We also want to tell Philippine President Noynoy Aquino that he has to exhaust all means possible to save Mary Jane. 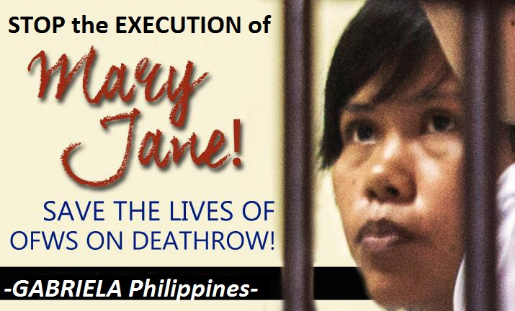 The Philippine government has ignored the family’s appeal for help and did not do anything to assist Mary Jane since 2010 when she was arrested. Jokowi and Aquino will meet in the next few days during the ASEAN Leaders’ Summit in Kuala Lumpur. Please join actions in your community, send letters to Indonesian and Philippine consulate in your countries, light a candle for Mary Jane. For more information and updates about the case and how to join the campaign, please click here.